Home » Selling? Why use a Realtor®? A good real estate agent can help you understand everything you need to know about the home selling process. Real estate transactions are one of the biggest financial dealings of most people’s lifetime. Transactions today usually exceed $150,000. If you had a $150,000 income tax problem, would you attempt to deal with it without the help of a certified professional accountant? If you had a $150,000 legal question, would you deal with it without the help of an attorney? Considering the small upside cost and the large downside risk, it would be wise to work with a professional REALTOR® when you are selling a home. Your REALTOR® will know when, where and how to advertise your property. There is a misconception that advertising sells real estate. NAR studies show that 82% of real estate sales are the result of agent contacts through previous clients, referrals, friends, family and personal contacts. When a property is marketed with the help of your REALTOR®, you do not have to allow strangers into your home. The buyers REALTOR® will generally prescreen and accompany qualified prospects through your property. Your REALTOR® can help you objectively evaluate every buyer’s proposal without compromising your marketing position. This initial agreement is only the beginning of a process of appraisals, inspections and financing – and a lot of possible pitfalls. Your REALTOR® can help you write a legally binding, win-win agreement that will be more likely to make it through the process. At Modern Market Realtors®, we have the patience and we take the time to make sure you completely understand all of your options and make certain all of your questions are answered completely. 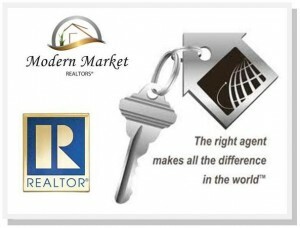 At Modern Market Realtors®, we ARE licensed members of the National Association of Realtors®. Using a professional to protect your interests and guide you through the process only makes sense.